Here are my top 5 things to do in Barcelona when you’re child-free. Visit the Sagrada Familia. This breathtaking cathedral is arguably Antoni Gaudi’s most famous piece of work, and it’s still being completed. Older kids would enjoy going inside the church but we relished being there, distraction-free. It gave us time to soak up the beautiful shapes and colours, and just sit in the cool air, looking up. Top tip: buy your tickets online (from €14.80 for a basic ticket without audio guide) to avoid the long queues that form most days. Read more on the official website. Marina Street, nearest Metro: L5 and L2 Segrada Familia. Eat tapas and paella (and drink cava) until the wee hours. You think you’ve eaten great tapas? If you haven’t eaten it in Spain, I guarantee you ain’t seen nothing yet! We ate in a number of tapas bars in Barcelona, and we didn’t find a bad one. Our favourite? Xampanyet on Carrer de Montcada – just be sure to book as it’s tiny and popular. Wander around the Gothic Quarter. The cobbled streets, the winding lanes, the quaint shops and cafes… the Gothic Quarter is just a dream to amble through. We discovered a great shop called Ale Hop, which is a Dutch chain store selling fun bits and pieces (think Tiger and you’ll be close). Hey, who says that when you’re in Spain you have to just shop in Zara and Mango? Spend the afternoon at Park Guell. It’s a bit of a faff to get to, from the city centre (a couple of Metros and a 15 minute walk) but it’s so worth it. Designed by Antoni Gaudi as a new housing development, he only got as far as designing and building two houses before funding was pulled. He lived in one of the houses (now a museum and worth paying the extra few euros to look around) overlooking the city. The architecture and flow of this park is incredible, and the views over Barcelona are pretty special. Top tip: buy your tickets online (from €7) as entry is timed and you might have a few hours to wait. 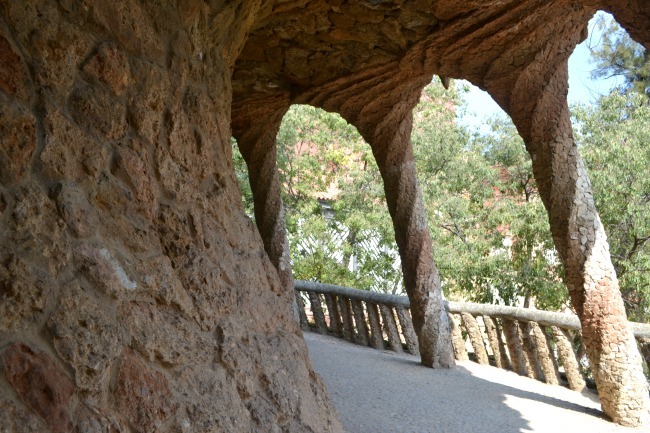 More information on the Park Guell website. Career d’Olot, nearest Metro: Vallcarca or Lesseps. Where are your favourite places to go, in Barcelona? Comment below and tell us!